Little did we know that my Kindle trouble recently was the start of a Kindle Rebellion at my house. Bookman, who rarely turns off his electronic devices, decided Friday that he would turn off his computer and his Kindle. Saturday morning his Kindle would not turn back on. I saw him go through the Kindle frustration cycles just like he watched me do when I took the drastic step of zapping my Kindle back to its original factory settings. I had hoped to swoop in like he did with me and save the day. It was not to be. I couldn’t get the Kindle to turn on either. I suggested that perhaps Bookman had let the battery run too low (he often does) and it just needed to be charged. So we plugged it into his computer. He had to go off to work. Hours later I noticed his Kindle still was not charged. I plugged it directly into the wall instead. But it still wouldn’t charge. The light remained orange and I noticed it kept flashing on and off like there was a loss of connection or something. But everything was fine as far as I could tell when I wiggled the cord. Saturday night Bookman came home and the Kindle that had been theoretically charging all day still did not show us the green light and continued to refuse to turn on. Unfortunately, you can’t just buy a new battery. After a few more attempts to get the Kindle working on Sunday we declared Bookman’s Kindle dead and pulled the plug. He has the day off today and decided to shop for a new ebook reader. He considered a Nook and a Kindle Paperwhite but in the end went for just the basic no frills e-ink Kindle. He ordered it. A little while later he picked up his dead Kindle to remove the cover and it was on! And working! Like nothing ever happened! He decided to not cancel the order for the new one, just in case. worse come to worst. But can one ever really trust a cat? Sure, they act like they love us, but one never really knows whether it’s true love or they’re just looking for a warm lap. So I am getting this message out while I can, before the Kindles block my internet and keep me from communicating with the outside world. 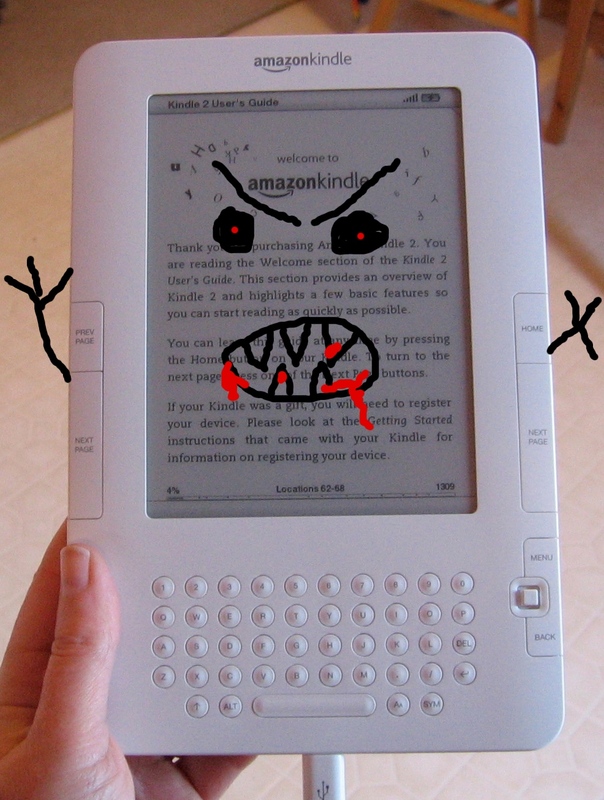 Beware the Kindle Rebellion! blank screen…..I’ll bet it’s related! we don’t have cats, though, just a dog. to electronics–kind of like us. For Kindles, I find it best to just ignore them. Good luck! I love your Kindle Rebellion image!!! Why don’t you guys get a couple of iPad Minis? The best, bright, colorful, and all the Kindle books you could ever want. Hmmm… I have an iPad but don’t use it for reading books – honestly, just doesn’t compare to reading from the Kindle (which is much lighter to hold, doesn’t tire your eyes and has lots of features that the Kindle app doesn’t eg. text-to-speech; annotations etc). booksaremyfavourite, I agree with your iPad and Kindle comparison. Kindle is much better to read on. Richard, I have a regular sized iPad and I have read only one book on it because I hated the experience so much. There is far too much glare. Also, they can;t be read outside in direct sunlight or while wearing polarized sunglasses, both of which Bookman and I do so e-ink is a requirement for our ereaders. Same! I have two Kindles because one day my old one wouldn’t sync – obviously not the end of the world but it was a good excuse to buy a Paperwhite! I’m so dependent on my Kindle right now. I still love paper and pages, but the ease of downloading a title when you’ve run out of anything you want to read is wonderful. No waiting until the next day and the hopeful, but often unrewarding trip to the library; no waiting for an ordered book to be delivered. A spare Kindle for the Bookman is probably a wise move. Rebellion quelled for the moment. Jenclair, Bookman and I are both dependent on our Kindles when we are out of the house. We take them with us everywhere. A spare kindle is probably a good idea. We’ll see what happens with the rebellion. Right, that settles it. The Bears have applied for their visas and are on their way. They will settle your kindles if nothing else does. I hope they are suitably shaking in their little kindle shoes. ‘little kindle shoes’! Love it. Those Kindles are really playing you! As I mentioned before, human sacrifice is probably the way forward. I don’t want to be a misery guts, and they are exceptionally sweet, but I fear your cats may not be entirely to be relied upon here. Catching dust bunnies is perhaps not enough to equip one with the resources needed for taking a principal role in the age-old struggle between Good and Evil. Too funny. Those tricksy Kindles! My old Kindle (Mr. Basic) still works well, but I really wanted something backlit, so I got Mr. Paperwhite, whom I am currently in love with. However, in a pinch, I’ll go back to Mr. Basic! Oh, technology. You make our lives easier and more fun but sometimes just a low-tech paperback is the best solution. wherethereisjoy, I know, right? Bookman’s is the first gen basic Kindle and it has been chugging along without a problem for 5 or six years now so we were really surprised by its sudden recalcitrance. He was going to get the paperwhite at first but then realized he didn’t need anything with a light and didn’t want the added weight so went with another basic one. You right about technology! I’ve had similar issues with my tablet which I sometimes use as an e-reader. Fortunately, I’m not a great fan of reading from a screen and I gave it a rest and went back to my paper books. It eventually started working again. Delia, thanks! As far as I know they haven’t learned to read, but they’ve had plenty of opportunity to learn while Bookman and I are away at work all day. Perhaps they are in league with the Kindles because they don’t need thumbs to turn the pages of an ebook! I have an iPad I read a book on once and I didn’t like the experience at all. The eink Kindle though is great and doesn’t feel like a screen at all. Still, I much prefer print books! Looks like the Kindle is an alien with a mind of its own, coming to take over the world, but first your home. 😉 Last Christmas I bought a mini iPad and have been using it as an eReader. Of course, I can use it for other things too, so much the better. I’ve not bought any eBook yet, but have read several already from our public library using the ‘Overdrive’ app. Loving it. Arti, isn’t it nice being able to borrow ebooks from the library? I’ve done it a couple times with especially large books that I didn’t want to have to carry around like Murakami’s 1Q84. Plus, it seems the wait list for ebooks is shorter than for print books which is always a bonus. Cute! Yes and I totally know what you mean! My Kindle Fire has been doing the same thing off and on lately . I love it for doing internet and entertainment things like it was designed for but honestly I cannot stand to read on it! I don’t know if it’s the light or the temptation to do other things than read that bothers me more. I’ve never had a traditional e reader but i kind of like how the kindle paper white looks . May purchase one especially as I am coming into my favorite reading season of Summer. joiedevivre, I hope your Kindle Fire starts behaving itself. I have an iPad and hate reading anything other than magazines on it. I much prefer the basic e-ink Kindle, no distractions, no backlighting, easy on the eyes and I can read it outdoors in full sunlight which is very important because I like to be outdoors as much as possible in the summer. Thank you Stefanie. Yes I hope it does too it’s a couple of years old now and well used but I hope to get more use out of it 🙂 Reading in the sunlight is very important to me as well. I really think I will enjoy the Paperwhite. Thanks for replying to my comment! I enjoyed reading your story it was really funny! Happy blogging and reading! May you paperwhite have many long years ahead of it! I am glad you enjoyed the story. Happy reading to you too! Your imagination is too active! Stop scaring me! I hope the Kindle learns that you guys are in charge and no more funny business! Iliana, heh, thanks! So far the Kindles are behaving again but we won;t let our guard down! I read this to my parents this afternoon, and showed them the photo of your defenders. They loved it. Lol! This is so funny. And yet, I am scared for you. We really need to have some sort of coded message at the ready in case the kindles rise up and take over…. you know, something that you could tap onto your blog with one hand, should the other be required for defense. I’m with Helen when it comes to the cats. They are adorable, but I have yet to witness a cat do anything useful. And I mean anything. Have your signal at the ready and we will rush to rescue you! Naw, you can’t trust a cat, but they are lovable nonethless! 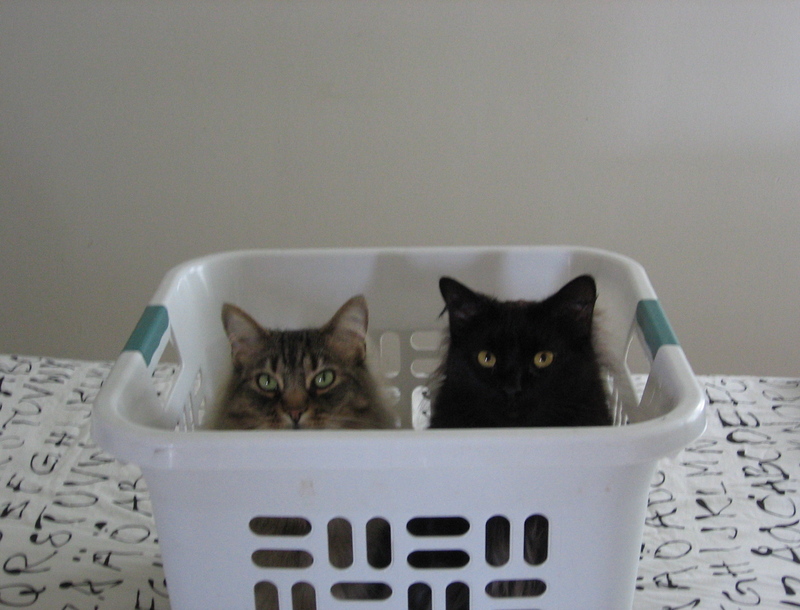 Especially when they pose so cutely in baskets like they have done here! Weird about the Kindle–Murphy’s Law. You know if Bookman had not ordered a new one it would still not turn on. At least now you will have one in reserve–always a good thing. But you ARE outnumbered–so be careful in case the machines ever rise up against us…..
Danielle, no, the cats are not to be trusted, they will turn traitors to save their own skins. Bookman has had the new Kindle for a couple days now and really likes it. It is smaller and lighter because it doesn’t have a keyboard and the clarity and contrast is much better too than his first generation one. But it will be good to have a Kindle in reserve in case mine decides to act up again.